From a young age he played piano and horn, taught by his father, a professional horn player, until he turned to the trombone, aged 10. After several years of studies at the Conservatoire de Limoges, aged 15 he entered the Conservatoire de Paris where he quickly obtained his diploma. He went on to win all the international contests open to his instrument (Geneva, Munich, Prague and Toulon). At 18, he became solo trombone of the Orchestre de la Suisse Romande, under the direction of Wolfgang Sawallisch, before some years later joining the orchestra of Opéra National de Paris. In 1989 he left the Paris Opera for the Hochschule für Musik (Cologne) where he spent time teaching and composing. In 1990 Gilbert Amy invited him to become Head of Brass at the Conservatoire National Supérieur de Musique where he directed the 18-strong ensemble Cuivres Français. 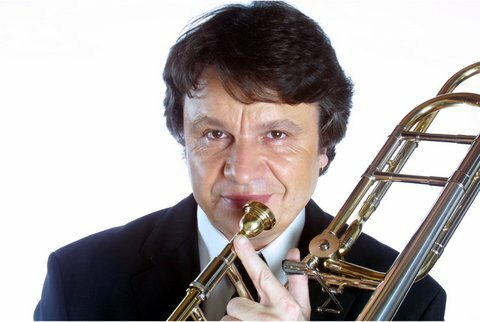 Since then he has joined the Conservatoire de Lyon where he is Professor of Trombone and Head of Brass.